Artesia High School students who will comprise the 2018-19 Court in the return of Basketball Homecoming pose for a photo at AHS. 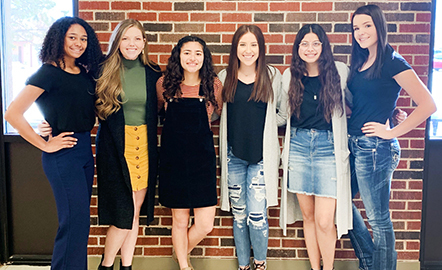 They are, from left, Junior Attendant Elliot Harrison, senior Queen candidates Tamra Frost, Estrella Villa, Nevaeh Guevara and Laura Azua, and Sophomore Attendant Kaylee Wagner. The Court will be crowned at 2:30 p.m. Friday, Jan. 18, in the old boys’ gym. The public is invited to attend.